What if Ahab were tweeting? Or Nancy Drew sending texts? Or Scarlett O'Hara texting Ashley? What if great literary characters had smartphones! The new book Texts from Jane Eyre by Mallory Ortberg is a novel built around the conceit of great literary characters texting and tweeting. 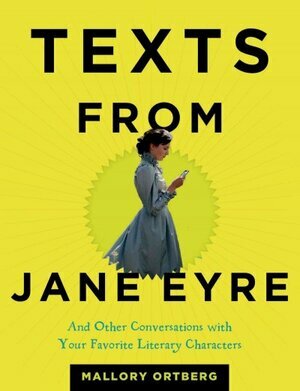 Texts from Jane Eyre also plays with many other characters from the Western canon, including Sherlock and Watson, Captain Ahab and Ishmael, and Nancy Drew and Ned. Check out Ortberg's website The Toast, which she co-founded with Nicole Cliffe, for more literary satire. And take a look at NPR's story on Ortberg. Now choose a character and let me know what he or she would tweet or text?